I had a feeling that I would enjoy the movie so much that I did a special mini DIY for the event. It was a super easy project, with amazing results. And, all you’ll need are five items to get you started. Yes, today we’re embroidering jeans! If you saw the latest Casual Cosplay of the Day, you may have noticed the jeans I wore in my second look. When I think of Wonder Woman, I envision her wearing a red bodice and, especially, star-emblazoned bottoms. As I was curating the Casual Cosplay look, I wanted to capture this same image without being too on the nose. 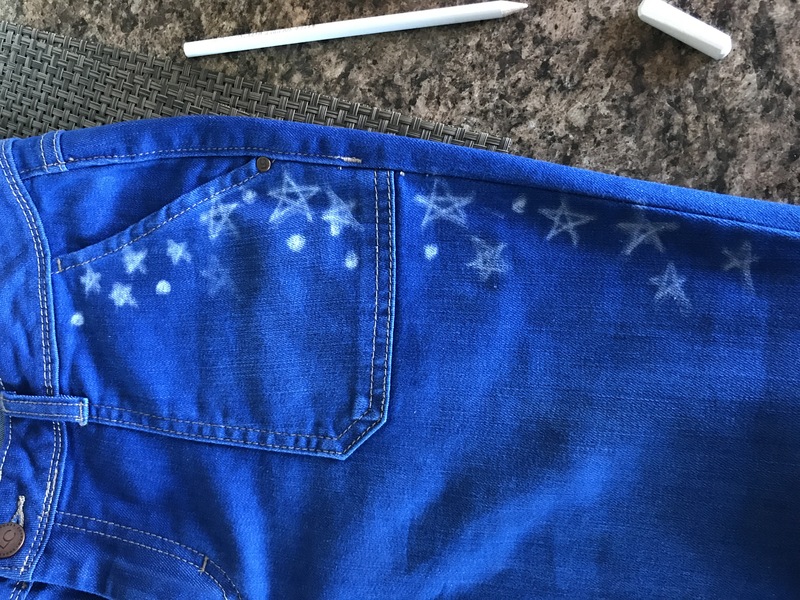 So I resolved to do something fun, easy, and a little nerdy to decorate a plain pair of jeans. After consulting the mighty Pinterest, I decided the best route was to hand embroider a pair of jeans myself. 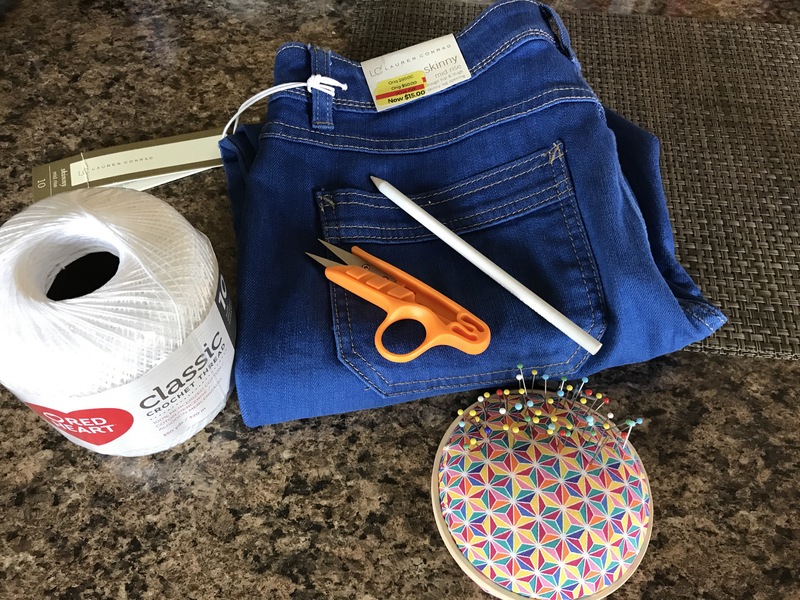 The results were these cute pants and this handy-dandy DIY! Take your jeans and lay them out on a large, flat surface. 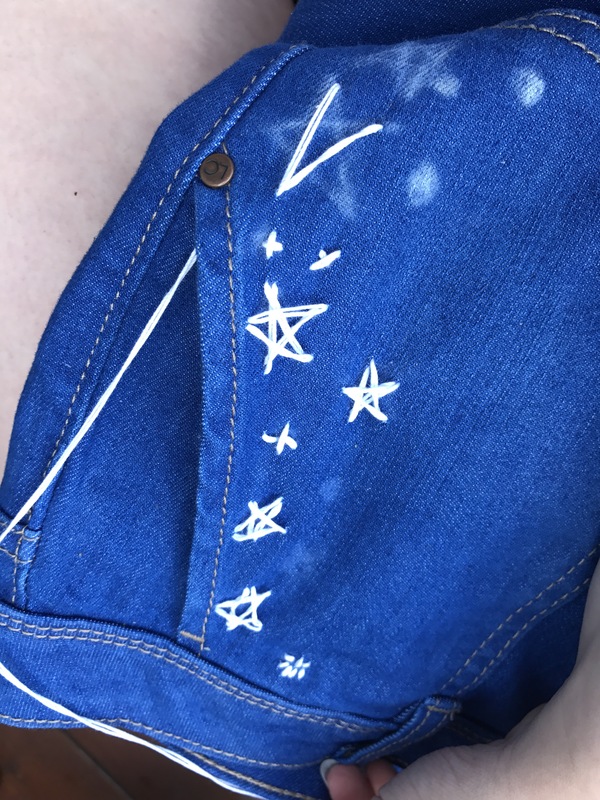 Begin to mark where you want to embroider stars with the tailor’s chalk. Unravel a long piece of embroidery thread and thread your needle. 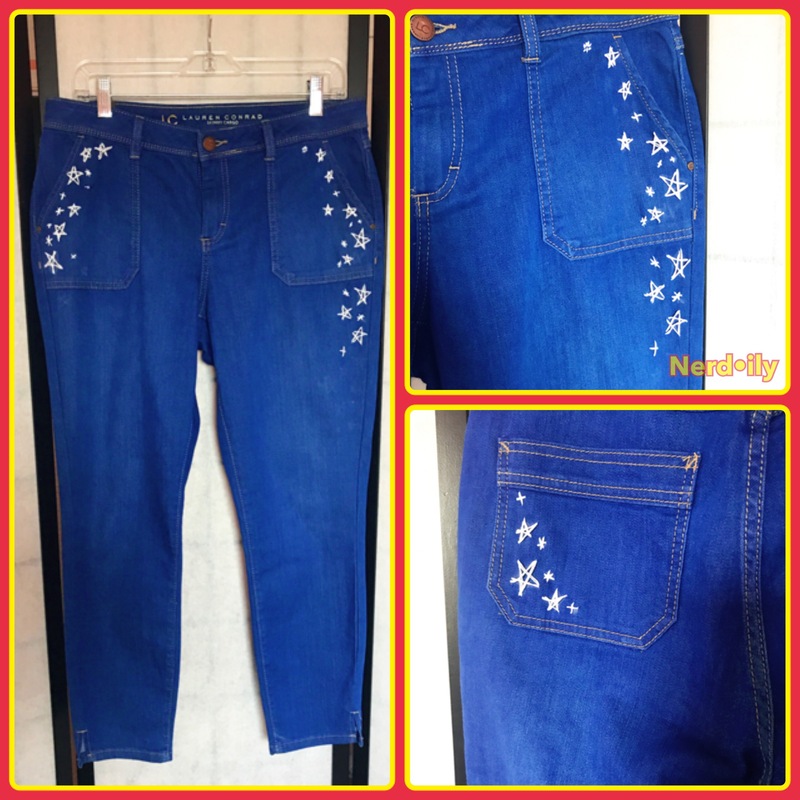 Begin to stitch in your star design into your denim. You can mix it up with conventional stars, sparkle stars, or starbursts. When you’re finished stitching in a star, make a knot and move on to the next part of your design without cutting the thread (you’ll basically have a continuous line of embroidery thread). When you get to the end of your design, make a double knot and snip the excess thread off. Move on to any other designs you’ve marked until you’re finished. When finished, take a damp washcloth to wipe off excess chalk markings. Now, wear your newly-decorated jeans to see Wonder Woman! See? Wasn’t that super easy? The best part is that you don’t have to have any prior sewing skill to complete this DIY. And, even if you’re not doing a casual cosplay of Wonder Woman, you can still wear these with any one of your favorite tops. It’s a win-win! What do you think of this DIY? Have you seen Wonder Woman? Let me know in the comments below so we can nerd out! I absolutely loved Wonder Woman and I’m planning on seeing it a second time. These are super cute! I love the WW style.